Dedicated to whom demands the best, Crancy Fresh Cat is a complete, tasty and balanced food for all cats. 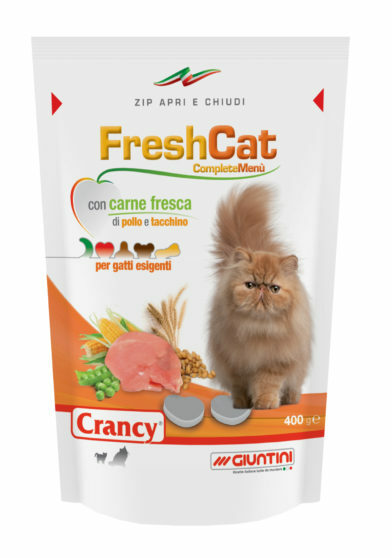 The recipe of Crancy Fresh Cat, with fresh chicken and turkey, has been formulated and developed by veterinary nutritionists to satisfy even the most exigent palates. Let your cat be satisfied by eating healthy with taste. 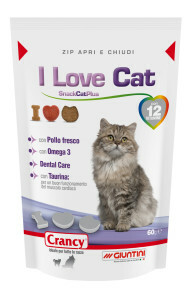 All the proteins of fresh meat in a balanced formula that will help your cat have a great sensation from the bowl. Cereals, Meat and animal derivatives (Fresh Chicken and Turkey meat 6% in “heart” shaped croquette), Vegetable protein extracts, Derivatives of vegetable origin, Oils and fats, Seeds, Vegetables, Fish and fish derivatives, Yeast, Minerals. Crude protein: 30%; Crude oils and fats: 10%; Crude fibres: 2,5%; Crude ash: 8,5%; Sodium: 0,3%. Vitamin A: 20.000 U.I./kg; Vitamin D3: 1.000 U.I./kg; Vitamin E: 130 mg/kg; E2 Iodine: 0,7 mg/kg; E6 Zinc: 16 mg/kg.